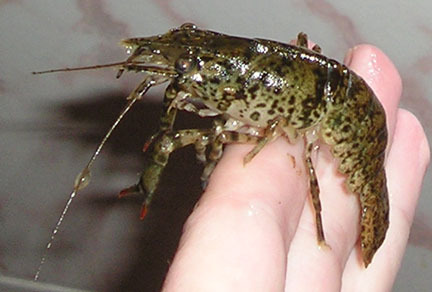 Diet: Like most crayfish, it is an opportunistic scavenger and will eat whatever it can find. However, this species shows more preference to vegetable matter than meat matter. Breeding: Unknown. I do not have a pair, and I do not know any other keepers who have pairs to know if mating will occur in captivity. Behavior in Captivity: This species is very sluggish and not particularly active. It requires a tank with sediment and decor similar to it's natural environment (sandy, muddy river beds with roots, rocks, vegetation), because it will want to burrow to hide. If this is not provided, or something similar created (artificial caves, tunnels, etc), this species will become very agitated and stressed. This species is non-aggressive and will not bother or hunt any tankmates (keep in mind, tankmates may bother it though). It will, however, move plants around in an attempt to created cover for itself or it's hiding spots. This species will "play dead" more often than it will tail-flick. 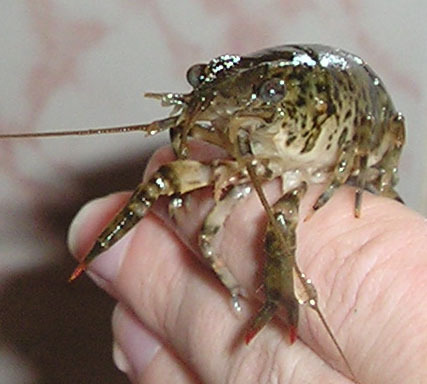 The crayfish literally freezes with all appendages facing forward underneath it. 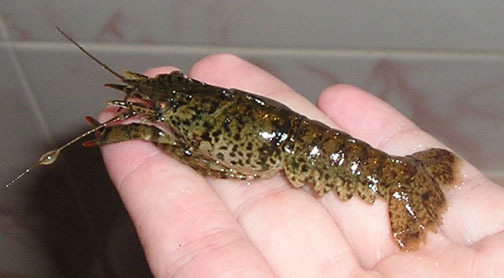 You can touch, pick up, roll, etc the crayfish and it will not move from this position. It will unfreeze when it feels safe again.